Panasonic PT-DZ570E projector is 4000 lumens and suitable for medium sized venues, conferences and other applications where image quality is a key requirement. The PT-DZ570 Series projectors incorporate a wealth of original Panasonic technologies to bring high-quality images to all kinds of operating conditions and applications. They offer better reliability and require less maintenance. Plus the PT-DZ570 Series features convenient functions to facilitate either a new installation or the replacement of an existing system. They are compact affordable 1-chip DLP projectors with a long list of features and functions including optional wireless operation. 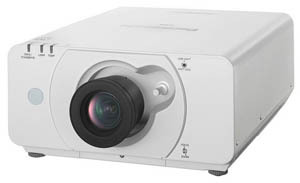 4000 lumen WUXGA 1-chip DLP projector in a 16x10 ratio, 2000:1 contrast ratio, beyond HD quality. Vert/Horiz Lens Shift, vertical keystone correction. Manual zoom, manual focus. Inputs include HDMI, DVI and VGA.